I bought a Bar Crusher 610c in June this year. I spent about six months researching what type of boat to get. 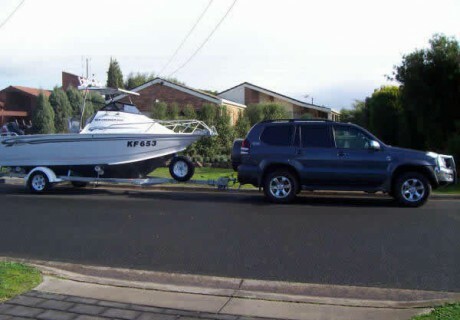 An aluminium boat was more practical for us because it would be lighter to tow and easier to handle, and I didn’t want the added worry of the occasional dent or scratch. First weekend dash to the coast (we live 3.5 hours from the coast) I had my eye on the weather forecast all week and it didn’t look promising. Friday night came and the weather was stilled supposed to be ordinary, but we decided to go anyway. We got up the next morning and headed to the Hastings ramp. Wind was a minimum of 20 knots and only going to get stronger, but we didn’t come all that way NOT to go out, so out we went. The boat was great and lived up to everything I had read about them. The conditions were rough at times, but the most important thing to me, having my young son with me, was that at no time did I feel we were not safe. What impressed my wife most about the boat was that on another occasion we went out at Hastings again and went down to Flinders. It blew up while we were there, so we had to head back. On the way back, our 2.5 year old daughter lay down in the cabin and slept the whole way back to Hastings and not once did she get bounced or rolled off the cushions once. The thing I like best about my boat is that I can plan to go fishing for a weekend and, regardless of most weather conditions, I know I will still be able to drive all that way and still get out on the water. The Bar Crusher has certainly reignited my love of fishing, so much so that I wish everyday was a weekend!